Bought it at Double Wars and is currently devouring the chapter about the cap of St. Birgitta. Very interesting. I’ve read what Isis (one of the co-authors) has published on her blog but that was of course just bits and pieces. 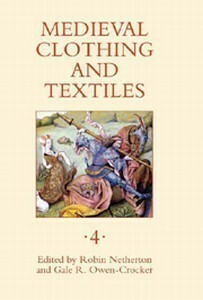 Åsa Martinsson at – Textilverkstad (in swedish), read the pdf here. Yesterday I visited Nicole (our shire’s newest member) and helped her out with some pattern making. She has also made a first draft for a St Birgitta cap! It’s really inspiring to get new productive members to the society. Now I really need to finish the chapter so that I can start making my own cap.